I noticed in a local rural cemetary that all the graves run east-west. It also appears that the Head stones are on the West end of the vault/coffin. Thus, I intuit that the Head is near the West placed stone, so as implied in Matthew 24:27 the body will rise facing east. I also understand this is generally normal for Catholic cemeteries. Note: This was not a Catholic cemetery. 1.) Generally, do Catholic cemeteries follow the same tradition or would the head of the coffin for some reason face West? 2.) Considering the image below, I would think you would need to stand facing West to read the print normally. The vault/coffin would be there in front of you -- east side of the headstone. Is this a correct understanding? 3) Another Catholic cemetery is similar to this image but the printing is on the other side(west) of the headstone. This seems to be at odds with tradition? At one time, it was true that Catholics must be buried facing the east. Is that no longer true, and was it a part of the same law which said that the altar in a Catholic Church must face the east. As anywhere, you may find older Catholic cemeteries that still accommodate this tradition. There is no requirement in church law regarding the position of burial. The only thing that comes close is a reference in the Roman Ritual of 1950 (no longer in effect) that stated that at the funeral Mass the coffin was to be placed so that the feet of the deceased should point toward the main altar. Presuming the church had been constructed so that a priest celebrating Mass would face the east, the deceased at the funeral would face in that same direction. Correctly, you suggest that the same values guided the traditional placing of a church’s main altar, so that the priest celebrating Mass could face the east. This evoked the Christian expectation as to Christ’s return. (See Mt 24:27: “For just as lightning comes from the east and is seen as far as the west, so will the coming of the Son of Man be.”) - Must one be buried facing east? There is no fixed rule nowadays and I know of some very traditional Catholic Benedictine cemeteries where the brethren are buried facing the south due to limited burial space. Historical precedents provide that, if the corpse is a layman, the feet are to be turned towards the altar. If the corpse is a priest, then the position is reversed, the head being towards the altar. The earliest reference to this is in Johann Burchard's "Diary". Burchard was the master of ceremonies to Pope Innocent VIII and Pope Alexander VI. The idea seems to be that the bishop (or priest) in death should occupy the same position in the church as during life, facing his people who he taught and blessed in Christ's name. If the corpse is a priest, then the position is reversed, the head being towards the altar. There are still dioceses and Religious Orders that still follow this tradition and I have personally been present at a priest's Funeral Mass where this is the custom. Sub question #1: Generally, do Catholic cemeteries follow the same tradition or would the head of the coffin for some reason face West? Some do and some do not. Let me explain. Ideally the custom of burying the faithful facing east is still popular in Catholic cemeteries, especially the old ones. Even in past centuries, exceptions can easily be found. Early martyrs were often buried under the altars of local churches. Other exceptions to the Church's desire to bury her faithful facing east in modern days is due in part to local civil law. Like I said before that the Church would be still desirous that this tradition still be intact, but because it is not always possible in our days, the Catholic Church no longer requires that the faithful keep to the tradition of the faithful facing east when buried. Some of the newer Catholic cemeteries have the faithful facing east, while others do not. Sadly civil laws have jurisdiction over cemeteries and civil law must be respected. Sub question #2: Considering this tradition, I would think you would need to stand facing east to read the print normally. The vault/coffin would be there in front of you -- west of the headstone. Is this a correct understanding? Sub question #3: Another Catholic cemetery is similar to this image but the printing is on the other side(west) of the headstone. This seems odd. Although not the traditional way of burying the faithful facing east, it may be due to either civil law, which takes precedence or due to the terrain of the locality. As you might gather from all the other answers, “Headstones” are far more common than are “footstones” At least they use to be. In some cemeteries they still are. And in many rural and small-town cemeteries, the graves are laid out with the feet all to the East, with the symbolism that all will be facing the rising sun on resurrection day. More modern cemeteries are not so picky, and lay out the graves so as to most efficiently use the available space. Footstones are VERY common, particularly in large commercial cemeteries, or any cemetery established in recent years. And there are a couple of reasons. The first is that the cemeteries involved in the “Memorial Park” movement earlier in the last century went for large expanses of open lawn, with a small flat marker for each grave (often at the foot). This meant it was easy for a visitor to NOT focus on the vast number of “other” graves and monuments, but on the ones that were important to them, in the midst of a lush park-like setting. There might be clusters of 6 or 8 graves around a central family monument (or upright marker). Each of the individual graves will have the head towards the large family marker, and at the foot of each grave (where I placed a dot) will be an individual flat foot-marker, or foot-stone. 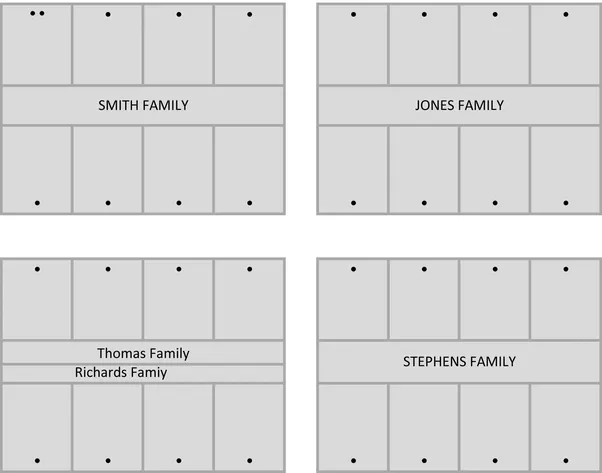 Sometimes the entire plot will be for one family, other times there might be two, as “Thomas” and “Richards” in my example. Each cemetery will have their own rules about how the overlap is to be handled. - Why do they bury people with the gravestone at their feet instead of at their head? Please keep in mind civil authorities may have guidelines that must be followed at the same time. Priests during Catholic masses typically(?) face East (Jerusalem?). If a funeral includes a mass, the deceased is probably feet-first towards the altar, so also facing east. The traditional Christian belief that, at the end time, Jesus would return from the east, is older than Protestantism. That said, facing is not a requirement. Not the answer you're looking for? Browse other questions tagged catholicism tradition historic-customs funeral or ask your own question. 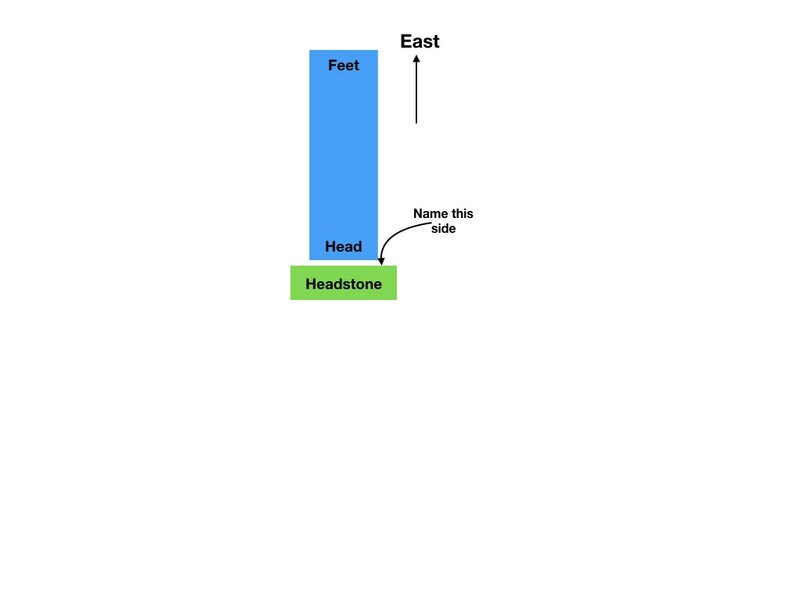 Why are people traditionally buried facing east? Why does the Catholic Church prefer burials over cremation?